Term 2 of 2019 will start on Tuesday the 23rd of April and will run for 10 weeks. Payments are due in by week 3 of term. There are still some outstanding payments from last term. If you haven’t paid or are unsure, please contact me ASAP so we can fix it up. Please make cheques payable to MATCH POINT TENNIS COACHING. Please make sure if you are paying cash, place in an envelope with name, day, and amount on the front to Coach. Payments can also be made via internet banking with the child’s name as a reference. If you would like to inquire about private or adult coaching, please talk to me directly to work out a time. All lessons that are cancelled due to wet weather will be made up during the term or during the holidays if necessary. Please understand that this procedure is in place so that we can provide the best possible service to all students involved in our programs. If you are unsure if the courts are too wet to play on, feel free to call or text Daniel on 0421 498 110. If for any reason you are unable to make it to a lesson, please let Daniel know as soon as possible so we can organise a makeup session. 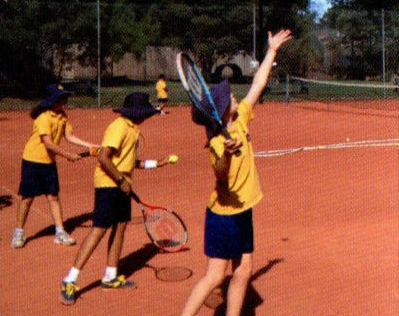 Lessons are taken place in a fun, friendly environment where students will learn whilst still enjoying tennis with their friends. f you are unsure if the courts are too wet to play on, feel free to call Daniel on 0421 498 110. If for any reason you are unable to make it to a lesson, please let Daniel know as soon as possible so we can organise a makeup session. To encourage more participation and involvement at Burnt Bridge Tennis Club, all players involved in term 2 tennis coaching are welcome to bring a friend along for a free trial lesson. All you have to do is let me know one week in advance so I can organise lesson plans. All racquets are provided.